"What WOULD schools have to give up for 100% of their kids to be proficient in Reading, Math & Science? Sounds pretty good to me. If you have the solution, let's get to it!" 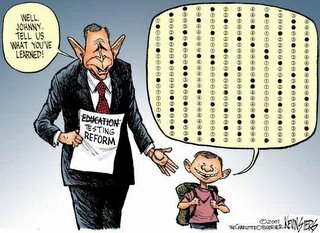 My premise is that in a pluralistic society where the school systems are run as democracies with locally elected lay boards, making the drastic changes necessary to reach 100% proficiency of all students by 2013-2014 under NCLB is near impossible. Most communities are not willing to give up what it would take. What WOULD schools have to give up for 100% of their kids to be proficient in Reading, Math and Science? Connecticut has sued over the federal No Child Left Behind law. Two-thirds of the state's school boards have signed on. Here is a Newsweek article that quotes the Minister of Education for Singapore talking about American schools. I think he gets it. I talked to Tharman Shanmugaratnam to understand it better. He's the minister of Education of Singapore, the country that is No. 1 in the global science and math rankings for schoolchildren. I asked the minister how to explain the fact that even though Singapore's students do so brilliantly on these tests, when you look at these same students 10 or 20 years later, few of them are worldbeaters anymore. Singapore has few truly top-ranked scientists, entrepreneurs, inventors, business executives or academics. American kids, by contrast, test much worse in the fourth and eighth grades but seem to do better later in life and in the real world. Why? "We both have meritocracies," Shanmugaratnam said. "Yours is a talent meritocracy, ours is an exam meritocracy. There are some parts of the intellect that we are not able to test well, like creativity, curiosity, a sense of adventure, ambition. Most of all, America has a culture of learning that challenges conventional wisdom, even if it means challenging authority. These are the areas where Singapore must learn from America. Does this mean we shouldn't worry about improving America's math and science performance? No, it just means we better not throw the "baby out with the bath water." The "baby" is the American sense of creativity and curiosity that continually challenges the world in application of new ideas for products and services. The free-wheeling representative democracy that has defined America, is what allows this culture to exist. The problem I see is that as teachers hunker down and overemphasize specific test results, the loss of creativity and curiosity is often an unintended consequence.